Samsung Galaxy Note 7 manages to top our list for October 2016. New smartphones will be added soon in our list after our detailed review. Almost every day, a new Android phone get launched, and it is tough for final users to decide which phone is best for them. There are plenty of mobile manufacturers that has different motives for producing these devices; some want to provide value for money, while other wants to provide the best performance. But at last, only those devices win that provide a proper balance between value for money, performance, build quality, features, after sale support, etc. So we decided to help you, and we enlisted top 10 Android phones, which, in our opinion, are the best smartphones that are available right now in the market. Please note that we update this list on a monthly basis, so please do check this article on a regular basis or bookmark this page for your ease. So let’s begin with our list of 10 best Android phones. After the much-debated battery bombings, Samsung is back with its arsons again and don’t worry this time it won’t explode. Let’s have a look at Samsung’s tremendously cool and talked about (pun intended) masterpiece: Samsung Galaxy Note 7. The features in this note heir are tremendous and unprecedented. It’s a 169 g weighing phone with 153.5 x 79.3 x 7.9 mm dimensions. It has Corning Gorilla Glass 5 back panel (Samsung’s inherent niche). It is IP68 certified, dust proof and water resistant up to 1.5 meters and 30 minutes. Galaxy Note 7 has also brought unprecedented design change. The symmetrical dual-curved design, which makes the phone look smaller and borderless than it usual size and even more exquisite. It has 5.7-inch screen size with a resolution of 1450 x 2560 pixels. It has multi-touch and super AMOLED capacitive touchscreen with Corning Gorilla Glass protection. It also has blue light filters, video enhancers, HDR to redefine the video experience. The battery is non-removable li-Ion 3500 mAh. Note 7 also Comes with different power saving options which will be a tremendous joy to gamers. The Primary camera of Galaxy Note 7 is 12 Megapixels with phase detection, autofocus, OIS, LED flash and 26 mm size with features like 1/2.5″ sensor size, touch focus, simultaneous 4K video and 9MP image recording, face/smile detection, 1.4 µm pixel size, geo-tagging Auto HDR and panorama. The secondary camera is of 5 megapixel, f/1.7 and has 22 mm dimension. Presently Note 7 has one of the best image qualities and camera experience in the market. It has microSD support up to 256 GB, and internal memory is 64 GB with 4 GB RAM. 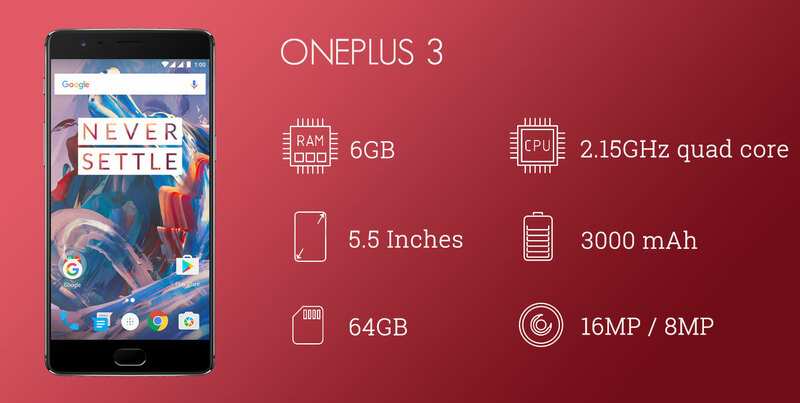 It has an octa-core processor clocked at 2.3GHz. It runs on Android OS, v6.0.1 (Marshmallow). It also has fingerprint reader same as the one on the Galaxy S7. The S Pen has also been updated for the more refined experience. This year Samsung topped the chart with its flagship devices, Note 7, Samsung Galaxy S7 Edge and Galaxy S7. Samsung secured top three positions in our list with a nice margin from other devices. You can read our complete review on Galaxy S7 Edge here. S7 Edge is the most beautiful device I ever had seen, the Edge display and super AMOLED screen just pops out of the phone and give a feeling of realistic images. It is very normal that you either have to sacrifice performance, or design or battery backup, but here you don’t have to worry about anything. S7 Edge is packed with a huge 3600mAh battery which is enough to power up the device for at least 1 and a half day without any limitations on usage. Samsung Galaxy S7 Edge comes in two variants, one with Snapdragon 820 and other with Exynos 8890. 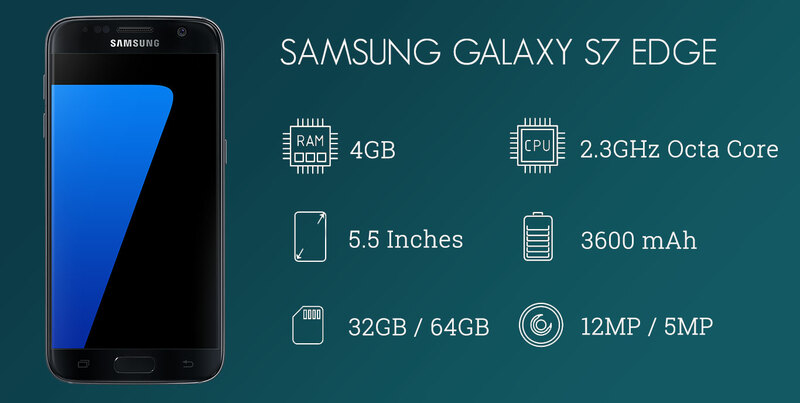 In my opinion, Exynos version is somewhat faster and battery friendly, but it may vary based on other factors. It has a beautiful 5.5-inch curved display which makes it stand out of the world. It comes with 4GB of RAM and 32GB/64GB of internal storage. You can also use a microSD card in place of second SI, which means that you have the option to use your phone either as dual SIM or a phone with single SIM and a microSD card. Not to forget about the camera, Galaxy S7 Edge has the finest mobile camera that is available at the moment. It has 12MP primary camera with f/1.7 aperture, 1.4 µm pixel size and optical image stabilisation. On the front, it holds a 5 MP selfie camera with f/1.7 aperture and auto HDR. From performance to design to battery backup to software features, Galaxy S7 Edge is an example of perfection. Though one might pull his hands from S7 Edge because of its price tag, trust me, S7 Edge is the best you can get on the market as of now. Third place in our top 10 list goes to Samsung Galaxy S7. It is very similar to Galaxy S7 Edge, but without any Edge display and has a smaller screen size and battery. Performance wise, it is exactly like S7 Edge, means performance is top-notch. 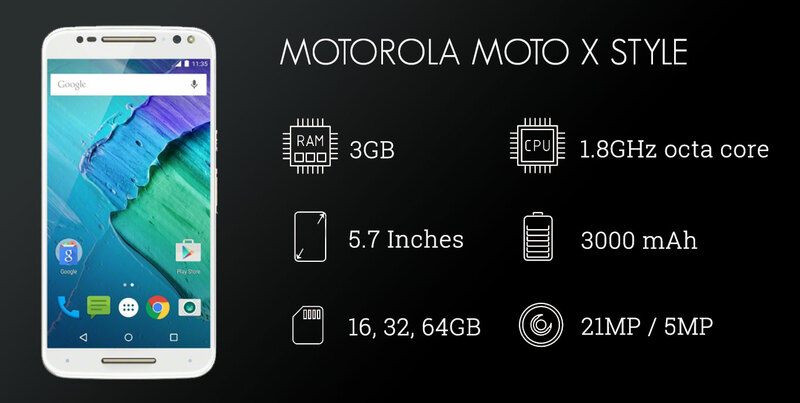 It holds the same Snapdragon 820 / Exynos 8890 chipset, 4GB RAM, 12MP primary camera and a 5MP front camera. The main difference is on the screen, where S7 Edge has a 5.5-inch curved display, S7 has an only 5.1-inch flat screen, though they both carry quad HD display. Galaxy S7 is backed with a 3000mAh battery as compared to a 3600mAh battery in S7 Edge, which means you will get slightly less battery backup with S7. If you are among the one who does not like curved display, then Galaxy S7 is the right choice for you. Not to forget that both flagship devices from Samsung come with fingerprint sensors that work quite well. 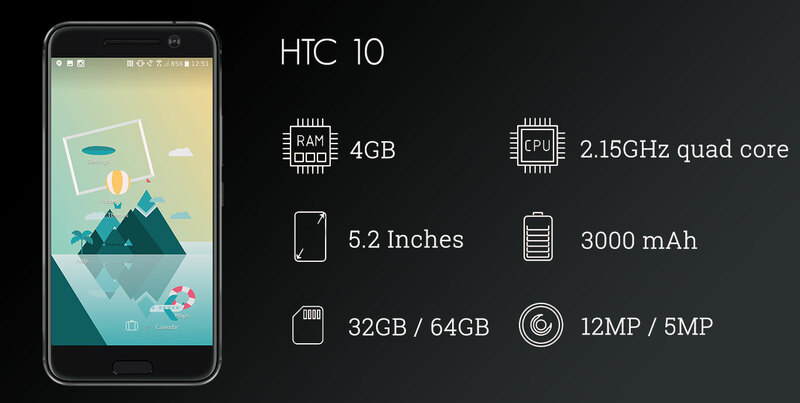 HTC 10 has adopted an entirely new modular approach and HTC has not hesitated to take such a significant risk. The modular phones are now a reality with the launch of HTC 10. Therefore it took 3rd place in our list despite having some minor issues. It was hard to choose between HTC 10 and LG G5, as both the devices are powerful and somewhat beautiful, but HTC got some edge over LG G5 at the end. HTC 10 has 5.2 inch Super LCD5 quad HD display with Corning Gorilla Glass 4 protection. It is equipped with Snapdragon 820 SoC and Adreno 530 GPU. Like other flagship devices, it has 4GB of RAM and comes with 32GB/64GB internal storage with an option for expansion up to 200GB. HTC 10 has Type-C USB, fingerprint sensors, Quick Charge 3.0 and NFC. HTC 10 is packed with a 3000mAh battery, but when compared to real life usage, it is not even close to the battery backup of Galaxy S7 Edge. To be frank, none of the flagship devices is the competitor of S7 Edge regarding battery backup. It features a 12 MP primary camera with f/1.8 aperture and OIS accompanied with 5MP camera at the front. After the success of OnePlus 2, the company released their flagship device for 2016, and it also went through the same success path. Though it also encountered the same marketing issues that were with OnePlus One and many people were not able to get their hands on this device due to invite system. But later on, OnePlus resolved this issue and the device is now readily available, and it is expected the same with their upcoming devices. OnePlus also follow a similar approach as Xiaomi, i.e. providing high performing device within budget. OnePlus 3 feature 5.5-inch Optic AMOLED with full HD display and the same is protected by Corning Gorilla Glass 4. It is equipped with Snapdragon 820 SoC and Adreno 530 GPU. It has 6GB RAM and 64GB storage without any slot for microSD card. It has USB Type-C port, fingerprint sensors and all other standard features. OnePlus 3 is packed with 3000 mAh battery which delivers one-day backup with average usage. It sports a 16 MP primary camera with f/2.0 aperture, OIS, laser autofocus, 1.12 µm pixel size and LED flash accompanied with a 8 MP front camera with f/2.0 aperture. OnePlus devices come with their custom ROMs with Oxygen UI based on Android. LG G5 is another high-end smartphone which is packed with the latest hardware. Though the device is excellent in performance, similar to HTC 10, it lacks to provide standard battery backup. The device is heavily priced therefore the customer wants to get what he has paid for, but if he is not able to use the device for a day, then he will get disappointed. Mobile manufacturers should take this issue seriously. Currently, Samsung is the only company who managed to provide good battery backup in its flagship device. 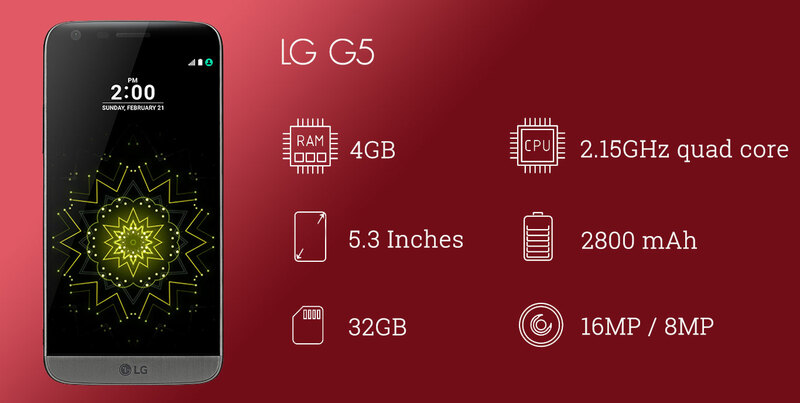 Coming to the specifications of LG G5, it is packed with Snapdragon 820 2.15GHz quad-core processor and Adreno 530 GPU. 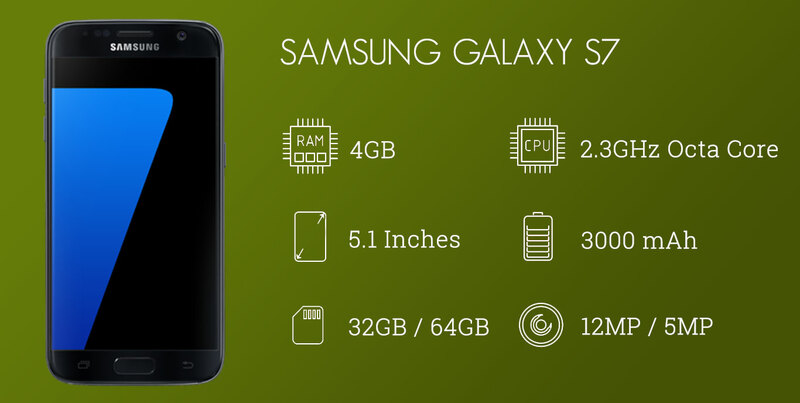 It also runs on 4GB of RAM and has 32GB of onboard storage which is expandable up to 200GB by using microSD card. G5 has a slightly bigger screen than HTC 10, i.e. 5.3 inches with quad HD display. LG G5 is equipped with a dual camera, for closer-up shots it has a 16MP lens with f/1.8 and OIS and for wide-angle shots, it has another 8MP camera which can capture 135-degree wide images. At the front, it has another 8 MP camera with f/2.0 aperture. LG G5, surprisingly, has a smaller battery than what is expected from a flagship device, it comes with a mere 2800mAh battery. Though the good thing is that it is user removable and support Quick Charge 3.0 technology, which can charge 83% battery in just 30 minutes. Don’t be surprised that Mi 5 can take 5th position in our top 10 list. We have calculated all the aspects of the phone, and Mi 5 provide the best value for high-end specifications and features. We cannot say that it has the smoothest experience, but the hardware specifications it provide with an economical price tag, we cannot resist our self to put this device on number 5. It is packed with the latest hardware and is the flagship device for the year 2016 from Xiaomi. It features a 5.15 inches IPS display with full HD resolution. The screen is protected with Corning Gorilla Glass 4. Currently, the device runs on MIUI 7, but soon it will be running on MIUI 8, as promised by the company. 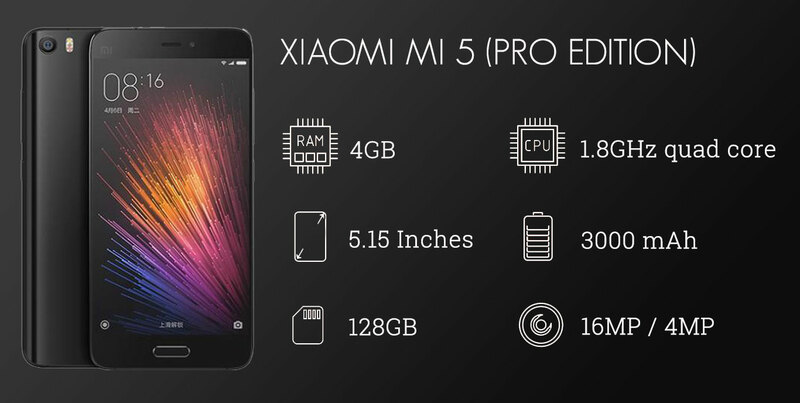 Mi 5 is powered by Snapdragon 820 and Adreno 530 GPU with 4GB of RAM. It has 128GB of internal storage, but it does not provide extra storage via microSD card. Xiaomi Mi 5 sports a 16MP primary camera with f/2.0 aperture, 1.12 µm pixel size and dual LED flash. On the front, it comes with 4MP camera with f/2.0 aperture, 1/3″ sensor size and 2µm pixel size. The other features include USB Type-C, NFC, fingerprint sensors, infrared port and Quick Charge 3.0 support. The device is backed by 3000 mAh battery and has a great battery life. 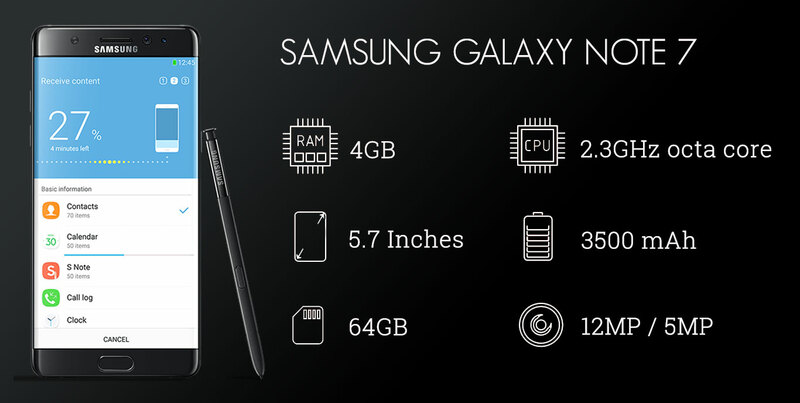 Samsung Galaxy Note 5 is a bit older device as compared to other devices in this list. But still, it is among the best performing devices till now. The only downside is the big screen size, which might become uncomfortable for small handed people, or users that want to use the device with one hand, but at the same time, it is a boon for individuals who loves to watch videos and movies on their phone. Note 5 belongs to Samsung premium Note series which has some exclusive features like S-Pen, which are performed by Stylus that is supplied with Note series. It features 5.7 inches Super AMOLED display with quad HD resolution and Corning Gorilla Glass 4 protection. 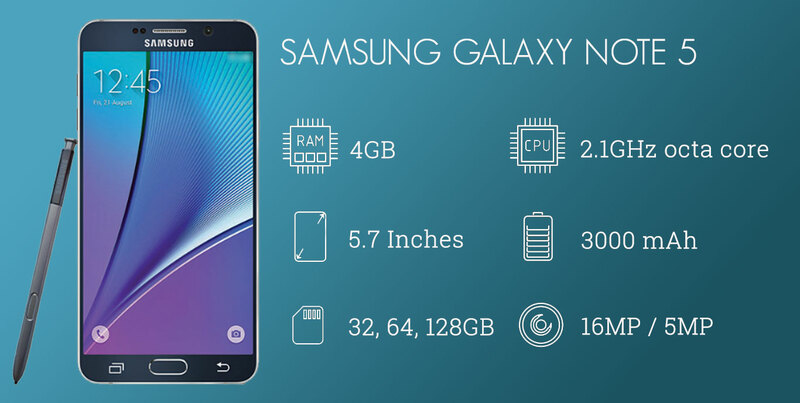 Note 5 is powered by Exynos 7420 2.15GHz Octa processor accompanied with Mali-T760MP8 GPU. It runs on 4GB RAM and has 32GB/64GB/128GB internal storage without any scope for memory expansion. The build quality and design of Note 5 is good, but not as good as S7 Edge, but being a 2015 phone, we can give this section a skip. It sports a powerful 16MP primary camera with f/1.9 aperture, 1.12 µm pixel size and OIS. At the front, it has 5 MP secondary camera with f/1.9 aperture. Recently Note 5 has been updated to Android 6.0.1, which has enhanced its performance and battery backup. Note 5 is equipped with 3000 mAh battery which provides decent battery backup and can last for one and a half day with normal usage. It has fingerprint sensors, NFC and support for Samsung Pay, though now all the premium devices from Samsung comes with Samsung Pay. 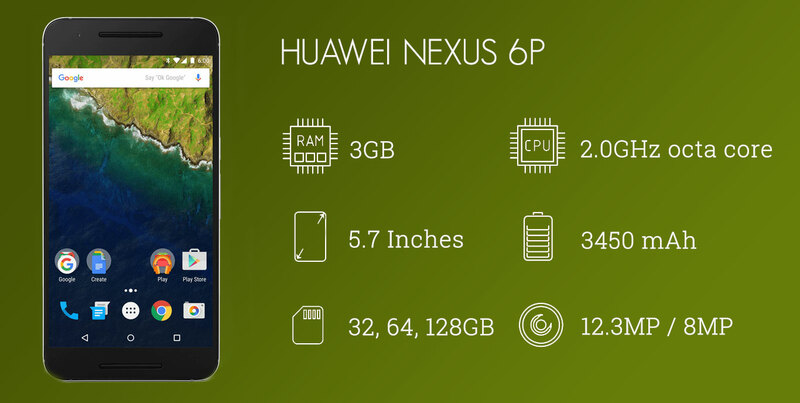 Nexus 6P is the latest Nexus flagship device which is manufactured by Huawei. Nexus devices have always been my favourite because they get the updates almost a year ago from other devices (count the developer preview period too). Until last year, Nexus devices had been my daily driver, but this year Samsung Galaxy S7 Edge has replaced Nexus. Android N is already available for Nexus 6P (Developer Preview) which is a major upgrade over Android Marshmallow. Nexus 6P is quite a big phone, or you can say a phablet. It has 5.7 inch AMOLED display but is wider and larger than Note 5. It has a quad-HD resolution of 1440 x 2560 pixels and has got the protection via Corning Gorilla Glass 4 and oleophobic coating. It is powered by Snapdragon 810 2.0GHz octa-core processor with Adreno 430 GPU. It runs on 3GB RAM and has 32, 64 and 128GB of internal storage. As always, there is no memory card expansion slot in Nexus device. Nexus 6P sports a 12.3 MP primary camera with f/2.0 aperture, laser autofocus, dual-LED flash and 1.55µm pixel size. On the front, it holds a 8 MP selfie camera with f/2.4 aperture. The camera cannot be said to be the best, but still, there are some great improvements from last year’s Nexus devices. This year both the Nexus devices comes with USB Type-C port and a fingerprint sensor at the back, which works flawlessly. Nexus 6P is a large device, and it needs a large battery. Therefore it comes with 3450 mAh battery which delivers one day of battery backup without any compromisation. If you love stock Android, this is the phone to go. Ninth position in our list is acquired by last year’s Moto X Style, which has a charming design and hands feel instead of being such a large screen device. The display is quite bright and the Moto exclusive features, like Moto Display, make the device stand out from others. It has a 5.7 inch IPS display with quad HD display and Corning Gorilla Glass 3 protection. It has very close to stock look with no bloatware except for some useful Moto features. Moto devices are the fastest to get the Android updates, just after Nexus devices. Being a 2015 device, Moto X Style is powered by Snapdragon 808 SoC and Adreno 418 GPU, but there has been no compromise in the performance, thanks to clean ROM. It comes with 3GB of RAM and 16, 32 and 64GB of onboard memory with an option to expand storage up to 128GB via microSD card. It sports a 21MP primary camera with f/2.0 aperture, dual-LED flash and 1.1 µm pixel size, though the OIS is missing. On the front, it has a 5MP selfie camera with f/2.0 aperture and LED flash. There is no fingerprint sensor in X Style. It is backed with 3000 mAh battery which provides a decent battery backup. The build quality is good, but the display protection is quite weak by default, so you need to put a nice bumper cover. LG Nexus 5x got the last position in our top 10 smartphone list. This does not mean that Nexus 5x is not good in performance or other features, but it has some disadvantages that make it slip back to 10th position. At the first look, you might not like its design and display. It carries a 5.2 inch IPS display, which is quite dull and might not excite you. But when it comes to performance, Nexus 5x is a good device, even better than Moto X Style. 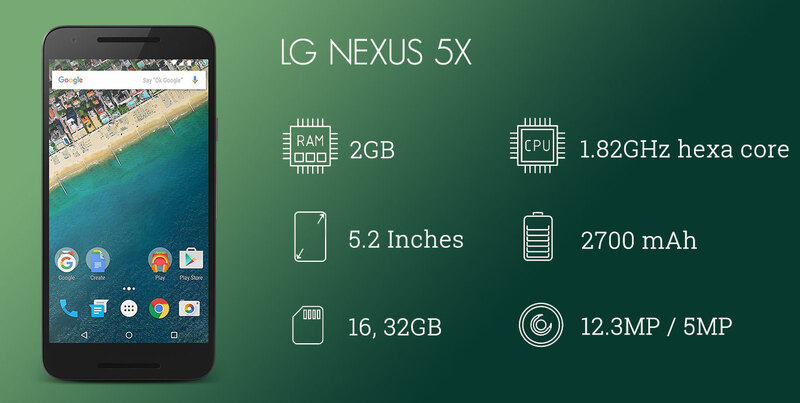 Nexus 5X comes with Snapdragon 808 SoC and Adreno 418 GPU. Though it has only 2GB RAM still, it is enough to run the stock Android. It has got the advantage of getting the fastest updates, same as Nexus 6P. It has 16/32GB memory variant, and there is no slot for memory card, which makes it inconvenient for people who usually store lots of music and videos on their phone. It has fingerprint sensors and USB Type-C port along with NFC. Nexus 5x is equipped with 2700 mAh battery which supports fast charging. Though you must be beware of Type-C USB phones, because you have to carry your data cable and adapter, as there are only a few devices with USB Type-C ports. Nexus 5x share the same 12.3MP primary camera that comes in Nexus 6P along with a 5MP front-facing camera. We will update this article on a monthly basis, so please bookmark this page and stay tuned with us.